And I’m Back is a mini-series column dealing with the return to Azeroth after being away for so long. 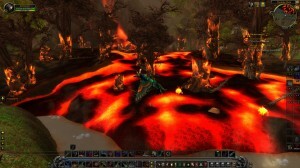 The series chronicles personal reactions to changes to discoveries and making the needed adjustments to the new Azeroth. Okay, so the world was recently split in two by the former earth-warder Deathwing. Corrupted and unreachable, the massive iron-clad dragon was brought down by an army of unprecedented strength, camaraderie and perseverance. Markedly different than the composition that ruined Archimonde’s plans, but no less effective. What do you do as a collective after saving the world from certain destruction (again)? Visit Darkmoon Faire? Instantly turn on each other? How about rebuild your ruined home, some still burning, others wickedly scarred by the Cataclysm? For the denizens of Azeroth, it seems that war will always be the answer. To be fair to the lore, the two hotheads in charge make factional war inevitable. I’m not belittling the point that tensions haven’t eased. 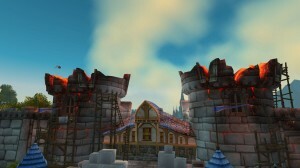 Moreover, I’m concerned with the fact that we’ve left our homes in ruins while we invade Pandaria, bringing our war to their unblemished shores. I’m not sure of the timeline difference between the demise of Deathwing and the discovery of Pandaria, but you’d think the people of Stormwind would have cleaned up a little, right? Put out the fires, mayhaps? Hopefully some upcoming content patches have us looking domestically. The current construction workers certainly aren’t doing their job. Fair to assume they heard how the last reconstruction went…? The Balance Between Endgame Boredom and Burnout: Is there such a thing as too much content?